Sometime this autumn after the final festival of the year in Telluride, theFred Shellman Memorial Stage in Town Park will be demolished down to the bare ground. A new stage long in the planning will debut in 2016. After a quarter century of full-blast Festivation, this old stage is naturally showing its age. Shoehorning Bela Fleck and a 40-piece orchestra onstage in 2014 underlined some of its drawbacks. But when it was constructed in 1991 during the administration of George H. W. Bush in the year Sarah Jarosz was born, it was absolutely state of the art. It was also at least the third Telluride Bluegrass Festival stage, depending on how you count them over the past 42 years. In the beginning there was no budget so improvisation was required. The 1st Annual Telluride Bluegrass Festival on July 6, 1974 featured the Black Canyon Gang, Denver Bluegrass Band, Normal Heights Lounge Lizards and the homegrown host band, Fall Creek, featuring Fred Shellman, John Herndon, J.B. Matteoti and Kooster McAllister. “That first stage was built by a bunch of us out of whatever scraps of wood we could put together. Nobody got paid or anything,” McAllister said. The 15- by -15 foot platform had no sides and just some tarps overhead. The platform wasn’t all that far above the dirt field where about 1,000 people were watching. Comfy grass sod and Killer Flank Steak were among the festival amenities yet to be invented. For the 2nd Annual Telluride a new and bigger stage was built reusing some of the original stage to make room for newcomers New Grass Revival and Ophelia Swing Band with Tim O’Brien. “The first time I played the stage was pretty rickety. I think they just put it up for the weekend,” O’Brien said. There were no backstage passes because there was no backstage. “There must have not been very much room onstage because I remember Duane Webster’s bass got kicked and broken but he played it anyway,” O’Brien said. In each of the following years the Telluride stage would be upgraded to protect the musicians from the elements and improve the sound. In 1977 wings were built on each side to accommodate sound equipment and more pickers for the all-star jams that were making the festival famous. McAllister said that the festival’s founding fathers had one simple goal. “Everything we did was designed to impress the musicians who were coming here so they had a good time,“ he said, including pointing the stage toward the town end of the canyon. There were some unintended consequences. Bluegrass and gospel music singer Sharon White has a vivid recollection of her first time performing with her Dad, Buck White, at Telluride in 1981. “I do remember baking onstage. My guitar got so hot it was hard to play,” she said, adding it was worth what it took to get to Telluride in those days. “It’s always a wonderful audience in Telluride. They are obviously music appreciators,” White said. As a member of Ophelia Swing Band, Hot Rize, solo and as part of remarkable Telluride-only bands, the festival experience has steadily evolved for the musicians and the audience. “It has gone from being very homemade to very smooth. It was good when we got dressing rooms. You didn’t have to walk a hundred yards from the green shed with all your stuff,” O’Brien said. 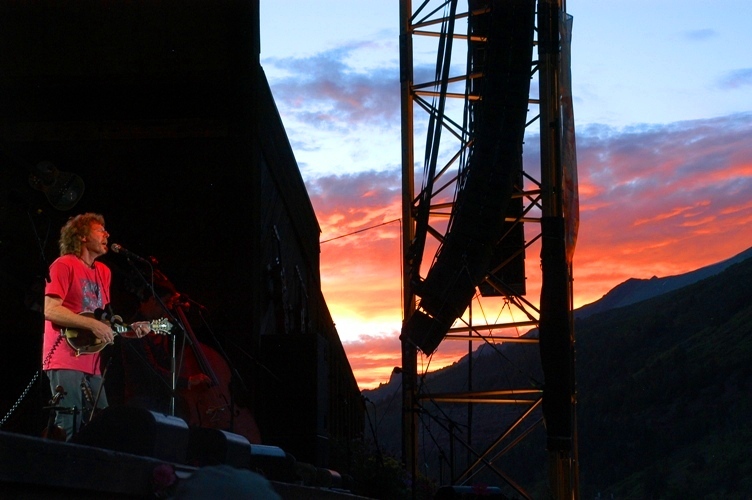 The Fred Shellman Memorial Stage debuted in 1991 dedicated to the memory of father of the Telluride Bluegrass Festival who passed away in 1990. 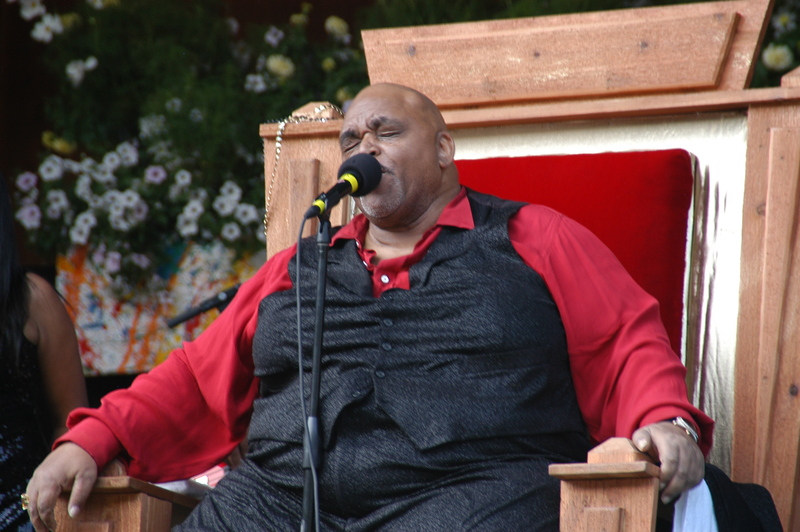 Giants of various genres have taken center stage here including Johnny Cash, the Drepung Monks, Earl Scruggs, Mavis Staples, Bobby McFerrin, Solomon Burke and John Hartford plus jazz, rock and blues royalty at the other Telluride music festivals over the past 25 years. Come close to the front of the stage and you see a plaque just below the middle facing the audience dedicating the Fred Shellman Memorial Stage. Around it is some heavily weathered barn wood that has traveled through time from the first and following stages. This part of this stage will also be part of the next along with the wooden sign which hangs above the stage. It was first hung in 19XX and the number is repainted on it annually. Kooster McAllister said that festival’s philosophy has always been: Take care of the musicians and the music will take care of itself. Telluride’s next evolution will be a $1.8 million, 56- by 44-foot modern stage that can hold 65,000 pounds, or about 50 pickers playing “Rollin’ in My Sweet Baby’s Arms” at the end a Sam set. After decades of watching musicians bravely picking on despite cold rain and snow, the new facility will provide heating for performers onstage along with permanent bathrooms, showers, green rooms and a catering facility over the next two years. Beyond changes to make it easier for stage crews and truckers to work, the improvements help make these already green festivities a little more sustainable in this fragile mountain ecosystem. As much of this stage as possible will be repurposed, much like the festival itself which has found ways to make old music live again for modern ears. Having engineered numerous live recordings at Telluride, Kooster McAllister’s fondest memory was playing on the early stages with Fall River and his own band. “After that I think of New Grass Revival. They were the reason the festival existed,” he said. 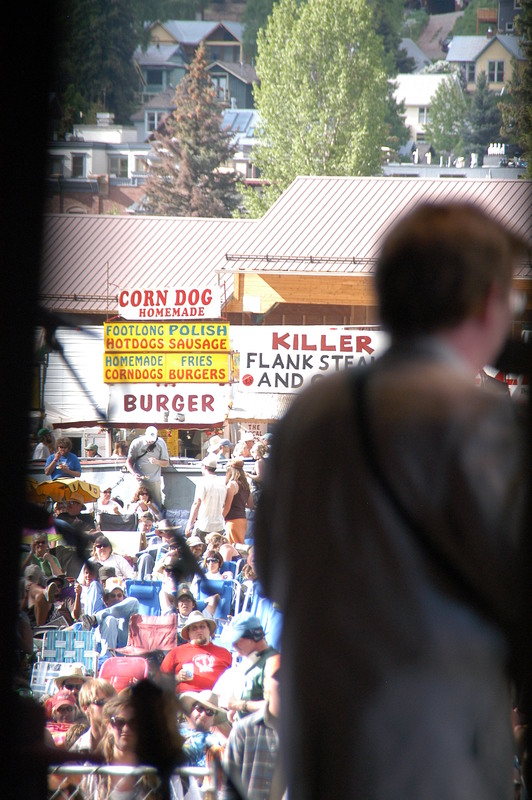 For all the music history that has played out on them, Telluride’s stages have been low-key except to be featured in every Festivarian’s experiences and photographs. The final rootsy notes of the festival on the Fred Shellman Memorial Stage will be sung Sunday night by family-style by Sharon White with her husband Ricky Skaggs, her dad Buck White, Ry Cooder and his son Joaquin. 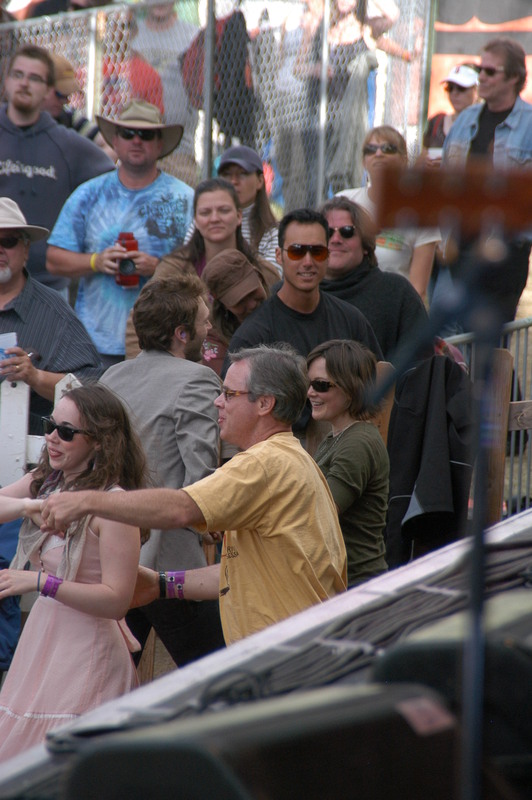 John Lehndorff has written about the Telluride Bluegrass Festival since the late 1970s. 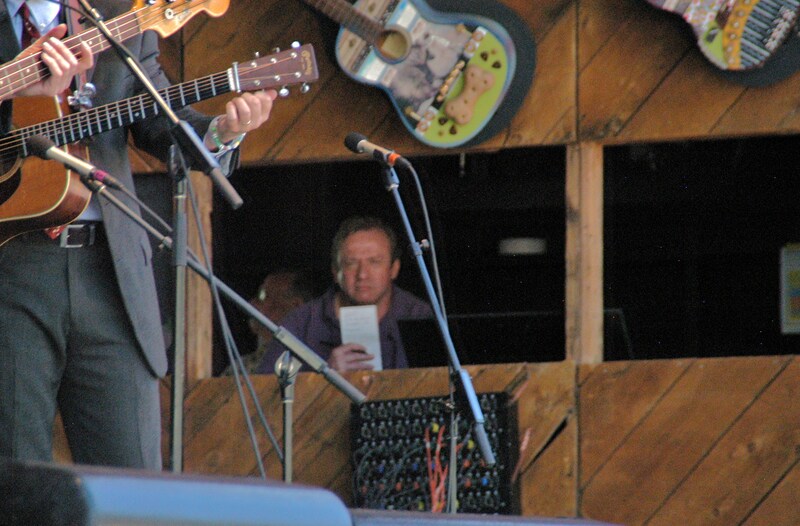 Tags: bluegrass, Fred Shellman Memorial Stage, music, Ricky Skaggs, Ry Cooder, Sharon White, Telluride. Bookmark the permalink. I sure hope the ‘new’ stage honors Fred Shellman’s memory. Without him, there would be no bluegrass in Telluride as we know it today, and no stage.